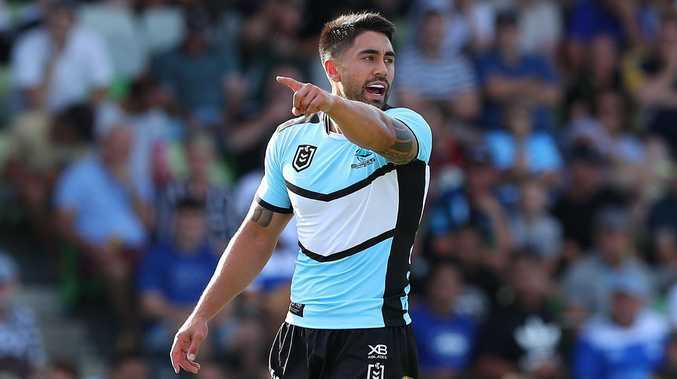 Shaun Johnson shows the way for the Sharks. "SHAUN Johnson will thrive under John Morris." It's a simple statement but one that retired Cronulla Sharks premiership winner Luke Lewis is willing to bet big on. The 17-year NRL player believes Johnson has been given a new lease on life since taking the reins at the Sharks and it is one that has been a long time coming. Johnson burst on to the NRL scene the better part of a decade ago, quickly turning heads with his blend of blinding speed and enigmatic flair. The Kiwi youngster soon drew comparisons with the great Benji Marshall and fellow enigmatic league star Sonny Bill Williams. His natural talent and ability to play what was in front of him even had rugby league Immortal Andrew Johns onside. "I haven't been this excited about a player in a long time," Johns said of a young Johnson at the time. But after more than 150 games in the top flight, Johnson has little to show for it. The Warriors' trophy cabinet remained bare and what was once new and fresh soon became stale. Johnson needed a rejuvenation. He needed a change. According to Lewis, he needed John Morris. "I think Johnny has a real good way of getting the best out of every player and knowing each of their best attributes, and that especially goes for Shaun," Lewis said. Johnson joined the Sharks as a pseudo-replacement for Valentine Holmes, who departed for a shot at the NFL. And with a sizeable forward pack in front of Johnson, including former Kangaroos Andrew Fifita and Aaron Woods, Lewis believes Johnson will get a chance to hit the reset button on his career. "I don't want to put pressure on Shaun at the moment but I think he is going to be really good for the club," Lewis said. "He has struck up a great partnership with Matty Moylan already and he has his backrowers working extremely hard for him. "The good thing is he is coming to a club where we don't just rely on the one person. Everybody in the side has to put their hand up to play in the Sharks team. "He has a great forward pack in front of him and some great young kids outside him. Shaun has a licence to play his brand of footy and let the team do the rest." 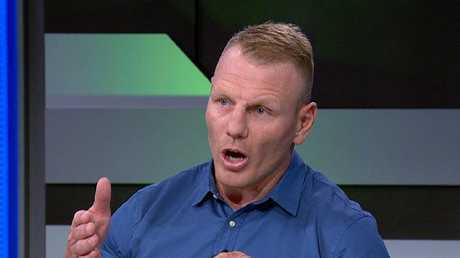 Holmes's shock departure for the NFL was only one of Cronulla's many off-season troubles, which included the deregistration of premiership-winning coach Shane Flanagan and salary cap breaches that were uncovered by NRL auditors after the club self-reported a minor breach late last year. Flanagan's ousting from the game has opened the door for Morris to make the step up from the Sharks' junior ranks. Lewis believes that time working with the fledgling Sharks will be his former teammate's greatest asset in his rookie coaching season at the top level. "I think Johnny is going to be outstanding for the club," Lewis said. "He has a really different mindset on the way he wants his players to play and to prepare, and I think the boys are thriving on that. "When he retired, he did his Masters degree in coaching and did all these programs with the junior ranks at Cronulla. "He has been with a lot of these kids through their progress through the SG Ball (Cup), Harold Matts (Matthews Cup) and into the under-20s competition. "His preparation will be totally different to what other NRL coaches are doing." The Sharks' backline has been decimated in the off-season with gun rookie Jesse Ramien heading to the Knights alongside Edrick Lee, and Ricky Leutele chasing an opportunity with the Toronto Wolfpack. It has opened the door for boom youngster Bronson Xerri, and the club has also recruited former NSW State of Origin centre Brett Morris to add experience to the backline. Luke Lewis is quickly settling into life after football. Lewis's retirement at the end of 2018 has also left a major hole in the side, but the 324-game veteran has not regretted his decision. "It has its ups and downs," he said. "You get so used to being told what to do and where to be every day that it actually becomes quite challenging setting your own schedule and sticking to it. "But then putting your body through the wrestling and the tackling, I definitely don't miss any of that side of it. My body is feeling better than ever - let's just hope it stays that way." While he might have hung up the boots, Lewis has not strayed far from the game, joining the sizeable Fox League broadcast team ready to tackle the season.